!! !THE COMFORT IS WITH US AT HOME !!!! 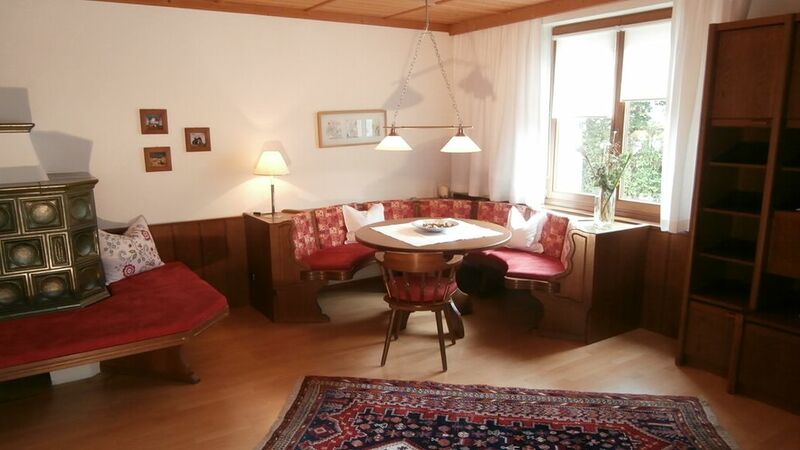 Our apartment is centrally located in Mayrhofen but very quiet, in the immediate vicinity of the Europe House. In winter, just a few meters from the bus stop, where you get our free ski directly to the lifts of the Mayrhofen mountain railways. In summer is our Zillertal mountains yours - start your tour right outside the front door. The Hintertux Glacier for year round skiing is only 17 km away. A cozy ambience gives our stove, which you will warm up and unwind after a day in the mountains. Our 80 sqm apartment is on the first Floor and can accommodate max. 5 people with two separate bedrooms. In addition, a well-equipped kitchen (cooking and eating utensils, coffee maker, dishwasher, bathroom / separate toilet, living room with satellite TV and a sunny balcony. A private basement storage for ski or Hiking equipment is of course available. For our younger guests, there's a children's playground in the garden. Completely RENOVATED in 2010 !!!! Low season: Prices ON REQUEST - Bargain !!! Lockable storage compartment for ski-u. Hiking equipment incl. Boot dryer available! Large spacious apartment in great location in Mayrhofen. Apartment has 2 double beds and one comfortable single settee type bed. Easily accomodates 5 adults. Central heating and plenty of hot water. Well equiped, you are short of nothing, and if you did find you needed something I'm sure Elisabeth would find it for you. Ski locker with heated boot holders in the basement. Ski bus tops right outside apartment. A number of great eating places within easy walking distance. I've been staying in apartments in ski resorts for 20 years and this is one of the best. Great apartment in brilliant location! We've just returned from a lovely week in Mayrhofen. We travelled as a family of four (two young children aged 5 & 7) and a family friend. We've skied a lot of different resorts in Europe and Canada . We're all teachers and have led various school parties so understand what works and what doesn't. Elizabeth is a brilliant and professional owner. Elizabeth even dropped off a lovely plate of Christmas treats and her husband left a small present for our children from the the ski school he instructs for. Constantly in email contact from the start, I even arranged to meet Elizabeth at Easter to leave a deposit. Nothing was ever too much trouble. The apartment is large in space, very clean and a fantastic location. A two minute walk and your in the centre of Mayrhofen. The ski bus stop is literally 20 yards from the front door. Boot and ski storage downstairs in the cellar (boot warmers present). Free wifi and the TV even accessed BBC 1 & 2 from the UK. The apartment is centrally heated and was very warm, even for my wife who feels the cold. We ate in several different places and the nearest is less than 100 yards away (great traditional food). This apartment is on the first floor, but would suit two couples or a young family who want to be near everything in the town, but in a quiet suburb. We definitely will be visiting this place again. We spent 4 weeks in the apartment in January and March 2013. The location is great because the Main Street and restaurants etc are only a few hundred yards away. The apartment is large and comfortable and the owner is a lovely friendly lady. We would all definitely stay there again. Für uns und unseren 11jährigen Enkel eine optimale Ferienwohnung in bester zentraler Lage und sehr nette Gastgeber. heerlijk ruim en schoon huis in het centrum van mayrhofen, in een rustige buurt. skibus voor de deur en eigen parkeerplek voor de auto. alles schoon en goed onderhouden. klein balkonnetje ook heel fijn. Fijn en compleet appartement op minder dan 5 min.loopafstand van het centrum van Mayrhofen. En voor de wintersporters; de skibus stopt 10 mtr.van de voordeur. Ook frau Hafner zorgt dat het aan niets ontbreekt. From the Inn valley motorway A 12, exit Zillertal, on the B169 always valley to Mayrhofen. In Mayrhofen center entrance go straight into the Sportplatzstraße, the apartment accros from the house Andreas. Die GELEGENHEIT - unser Nebensaisonsangebot ( Mai - Juni- September-Oktober-November) zum SCHNÄPPCHENPREIS - 1 Woche nur Euro 390,00!!!!! ( 2 bis 4 Personen Endreinigung und Ortstaxe inklusive) Gesamtpreis für 4 Personen - für eine Zusatzperson werden 10 Euro berechnet! Weitere Details auf ANFRAGE;0)) Preise je nach Dauer des Aufenthaltes. Preis je nach Personenzahl!